Please refer to our stock # 3023 when inquiring. 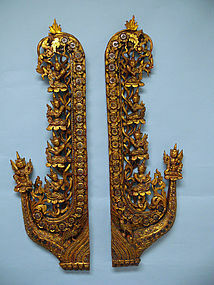 Pair of Monumental Thai Gilt Red Lacquered Wood Panels, Bangkok Period, ca. 1875 CE. Each carved with delicate deities, flowers, foliage and with glass inlay. Repair to top floral finial on right panel, see images. 39" high x 12" wide x 2" deep and in excellent condition. The New Work Encyclopedia states Thai “Rattanakosin art” (or “Bangkok” style) refers to the style of art of the time of the Chakri Dynasty, founded in Bangkok after the collapse of Ayutthaya in 1767. This period is characterized by the further development of the Ayutthaya style, rather than by innovation. One important element was the Krom Chang Sip Mu (Organization of the Ten Crafts), a government department originally founded in Ayutthaya, which was responsible for improving the skills of the country's craftsmen. The ten divisions of the Krom Chang Sip Mu give an overview of the craftsmen's arts existing in Thailand during the reign of the Great King Rama V (1853-1910). Drawing: Craftsmen, illustrators, pictorial gilders, lacquer craftsmen, painters, muralists and manuscript illustrators. Engraving: Woodcarvers, engravers, woodblock cutters, architectural woodcarvers, silversmiths, goldsmiths and jewelers; enameling, inlay and embossing. and architectural woodcarvers. Sculpting: Sculptors of plaster and papier mache, decorative fruit and vegetable carvers. Modeling: Bronze casters, figure modelers, mask and puppet makers, stucco sculptural and architectural modelers. Figuring: Makers of animal and bestiary figures, figure assemblers and lantern-makers. Plastering: Plaster craftsmen, stucco workers and sculptors. Molding: The making of Buddha images, bronze and metal casting, modeling with clay and bee's wax. Lacquering: Lacquer work, gilding, glass mosaic, mother-or-peal inlay work, Buddha images, carvers of wooden panels and pictorial gilding. Beating: Metal beaters, manufacturers of monks’ bowls, jewelers, silversmiths. Thai Rattanakosin art can be classified into two periods: the promotion of classical Siamese traditions under the reigns of Kings Rama I, Rama II, and Rama III; and the period from Rama IV until the present, during which modern Western elements were incorporated into art styles. During the early Bangkok period, numerous works of older sculpture were brought to Bangkok from war torn areas and little new art was created. Later works were ornate, and the simplicity of the earlier period was replaced by lavish ornamentation. During the second period, the images became more human, employing realistic body forms, hairstyles, and pleated toga-style robes. Mural painting and temple ornamentation flourished following the establishment of Bangkok. Beginning in the mid-19th century, paintings show the influence of Western art.